This entry was posted in Motherhood, Work on May 29, 2013 by admin. I watched my baby brother get married on Saturday, and it was a fabulous wedding. I’m not going to say it was the best I’ve ever been to, because honestly, every wedding I’ve ever attended of a friend of mine (as opposed to say of my date) has been very special in its own way. However, this one meant more to me than any other than my own, since K and I are very close. 1.) E’s dress and veil. She was a stunning bride. 4.) the band – awesome! From my own wedding, I thought I’d recall some of my favorite things as well . . . 2.) Jonathan’s attire and overall look – so handsome! This entry was posted in My life on May 27, 2013 by admin. We are finally in Richmond. I am so glad to be here! It has been a long trek. First, or course, was the 5 hours plane flight to NYC. This meant getting up at the crack of dawn to get to the airport two hours early (since we were checking luggage and concerned about hauling all our stuff through security, one hour delay, 5 hour flight, collecting luggage and then nearly an hour taxi ride to Park Ave, where B’s mother lives, believe it or not. The flight was really quite smooth and would have been a picnic without a baby. However, it was overbooked, and we didn’t buy a seat for L, and I’m telling you, sitting for 6 hours with a baby on your lap is no walk in the park. The plane was a bit hot, and L is a little furnace, and I was broiling. Anyway, I pretty much detest flying as I have mentioned a time or two, so I’m glad that’s over. L did veryy well but had to be constantly entertained. I tend towards claustrophobic, and middle seat with a baby on my lap made that worse. The only time L really started crying was on descent, as her ears were hurting her, but I nursed her, and she actually fell asleep. Nursing on a plane is definitely interesting. It is necessary to toss modesty to the wind, especially if, like me, you do not normally nurse in public. New York was New York. We didn’t really do much. My first visit to NY with B was wonderful and romantic as we did the tourist thing and he was a wonderful tour guide. However, these days our trips are short, so we mainly socialize with his family. They are, not surprisingly, obsessed with the little one. His step-dad, who is notoriously a touch prickly, apparently declared L had the best personality of any baby he has ever encountered. Naturally, I lapped this up. However, I have to say that while visiting NY as a tourist is fun, living there would not be my cup of tea. Too hot, noisy, crowded and inconvenient. I think I would really hate living in Manhattan. I do like living in or near the amenities of a city, but Sea.ttle is plenty big enough for me. Our taxi ride to the train station was harrowing, to say the least. We had decided to take the train as plane tickets were $500 apiece, or $1500 total, whereas the train tickets were only $300 total, and for that amount of money, I was able to reserve us a sleeper car. Overall the train experience was pleasant on the train. The only downside came once we were south of DC. We’d seemed more or less on schedule until that point, but we slowed down drastically. B and I had packed up and were all ready to go. We got shuffled out of our roomette (as they were going to give it to someone boarding soon) and woke L up from her nap. Cue extremely grumpy baby while we crawled along at 5 mph, or so it seemed. We didn’t want to change her or nurse or really do anything because we thought we’d be getting off at any minute. Instead, we crawled along for an agonizingly long time, before finally arriving. L was extremely unhappy on the drive home as well. All in all, it was a 9 hour journey, again, no joke with a 1 year old. I love being in K’s house, though. It is beautiful and very comfortable. He and his fiancee, E, picked us up yesterday. We are heading out for a run with them this morning. Today is a nice relaxing day before wedding events start slowly tomorrow, then pick up on Friday. I’m so excited and happy for K! I just love his fiancee and I think they’ll be so happy together. I also can’t wait to dress L in her frilly pink dress. This entry was posted in My life on May 22, 2013 by admin. 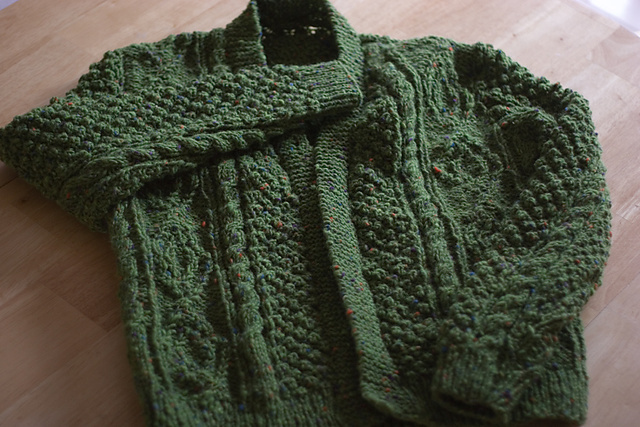 After just over a year, I finally finished Kevin’s sweater. 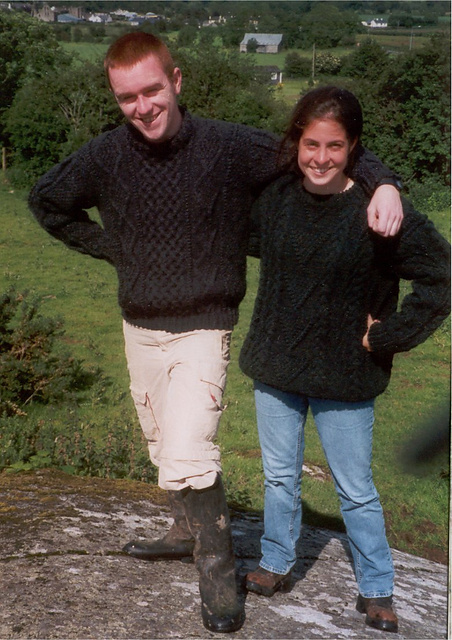 An Aran sweater is always a major undertaking. I’ve knit several. The first went to my ex-boyfriend John. I have mixed feelings about this given that we are no longer in touch. I hope that someone is getting use out of the sweater. The second sweater I kept for myself. 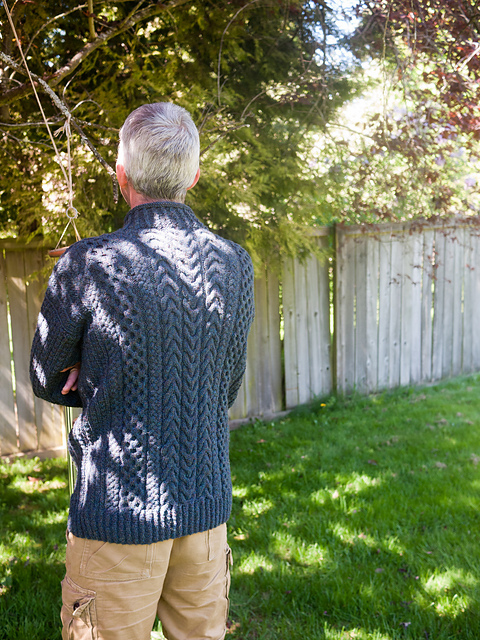 I knit this one with large needles, and it’s a cardigan. 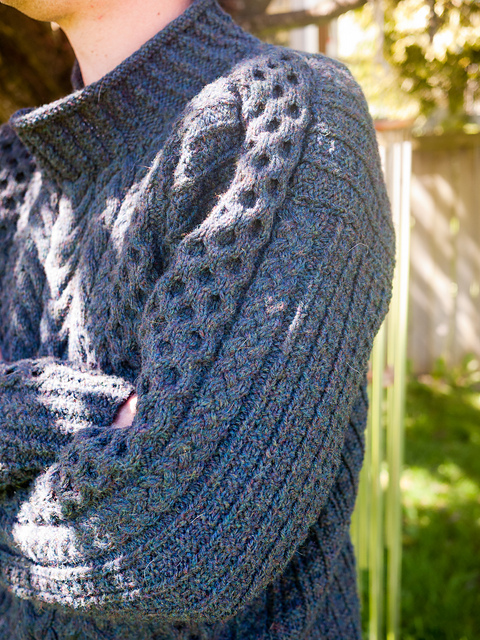 I probably like it least of the sweaters I’ve made. 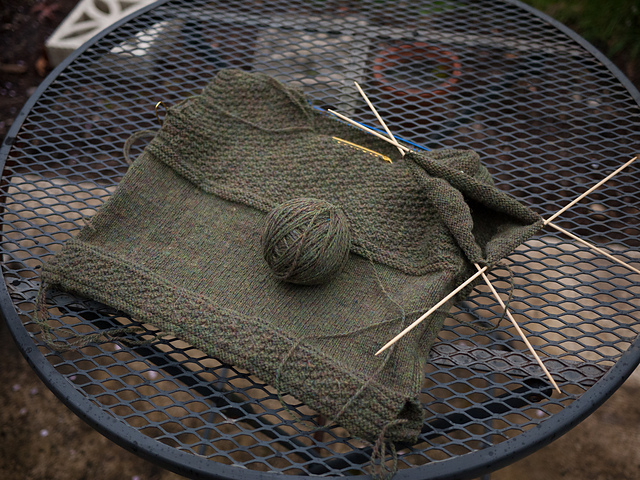 Knitting is definitely something you become better at with time. 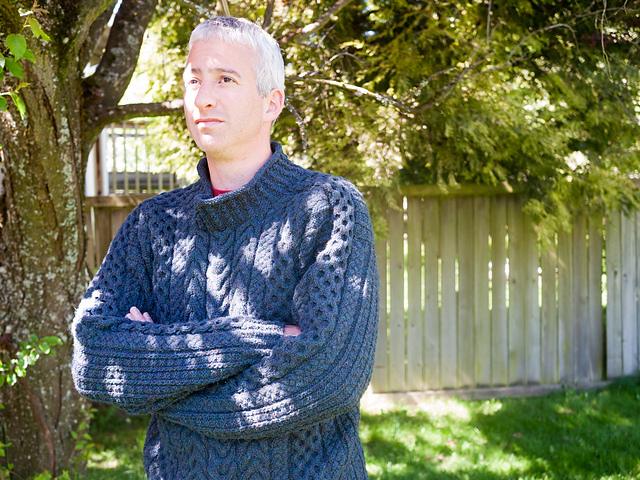 The next sweater I knit turned out to be bigger than I intended, and so it didn’t really fit me. However, fortunately, it more or less fits my Mom. It’s just a little big on her. The colors are not suitable for a man, which is a pity, since it fits B very well. I absolutely love the colors in this yarn (which I also used to make a blanket for Henry), but the yarn was really too stretchy for an Aran. 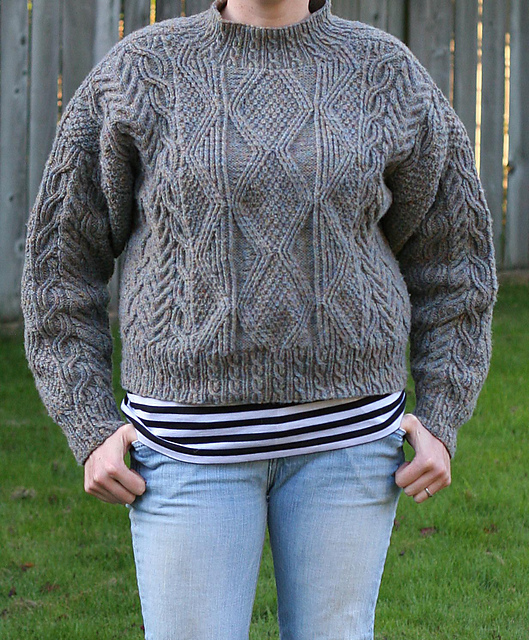 The next sweater I knit I kept for myself. 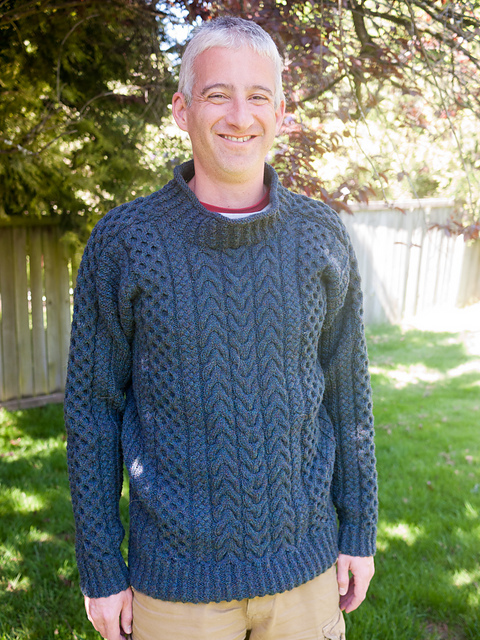 It was probably the most difficult sweater I’ve made. It turned out well, but I wish I’d made it a bit longer. 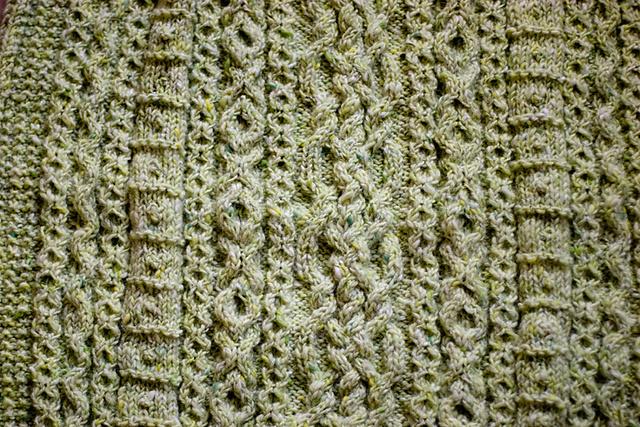 The sweater I just finished may be my favorite one yet. 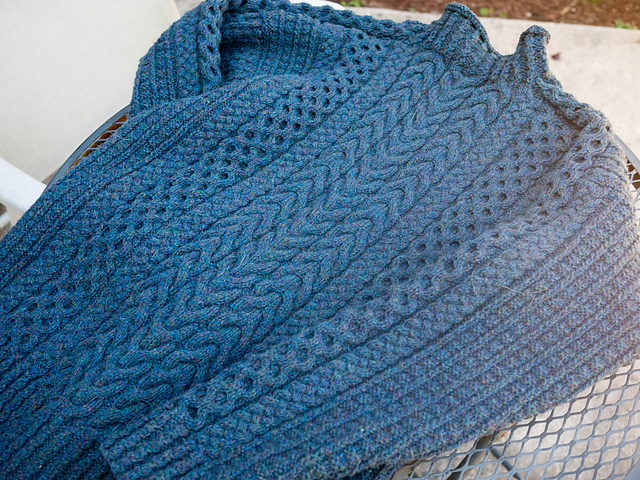 I love the color of the yarn, and the pattern is gorgeous. I’d been wanting to make it for ages. It fits B well, maybe a little big, so I really hope it fits my brother. He is 6’4″, and I just hope the sleeves are long enough. Fingers crossed. 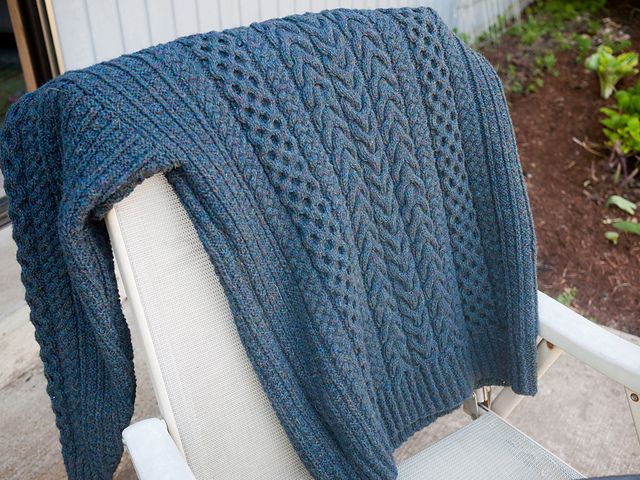 This entry was posted in Knitting on May 10, 2013 by admin. L finally figured out how to put the little wood blocks on her stacker today. We’d had the stacker outside her play area for a while (as I try to rotate her toys), and I brought it out today, and she just started putting the blocks on. She’s still not coordinated enough to do the bigger pieces, but she handles the little ones no problem. It’s so interesting to me how she can just all of a sudden gain the capability to do this or that. Eating is just ridiculously messy these days. L insists on trying to feed herself with a spoon, but she doesn’t understand that she’s shouldn’t turn it upside down, so it gets upended on basically every spoonful. Yup. Then, she’ll rub the spoon in her hair. She also likes drinking out of my glass, and prefers to do it herself. About 50% of the time, she’s successful. The other 50% of the time, she’s either chokes herself on the water or dumps it all over herself. Our book-reading dynamic has changed a bit. These days, L does not usually have the patience for us to read through an entire page of a book. We speed-read, but unless there’s very little text, she flips the page before we get through it. However, she has become more interactive. Her favorite book is called Horse, and she enjoys pointing (upon request) to the horse on every page. In general, she likes pointing to pictures of various animals (cats, dogs and horses mostly) upon request and noses and eyes and so on. She is still not walking on her own, but she LOVES to walk while we hold her hands. We have walked probably as much as 3/4 of a mile like this. B and I do not love it quite as much, as it is a back-killer. We both are looking forward to the time when she’ll walk just holding one hand instead of two. L is also really into walking up and down steps – while safely holding onto our hands, of course. She has stood up for brief periods without assistance but does not like to. Our L is definitely cautious. This entry was posted in Isla, My life on May 3, 2013 by admin. Because she is not a citizen and is obviously not making a ton of money, N is in a difficult situation. I believe it’s possible for her to live the American dream and “overcome.” To do so, she’d have to work harder and be much smarter than L or I have to be. And that is probably too much to ask. I want to mother her and boss her around in terms of getting through the college degree she’s working on parttime and choices about buying a car versus health insurance and so on, but it is of course not my place and I don’t want to be obnoxious. So I won’t do anything. As a woman who clearly loves children and no doubt will want her own, N’s challenge is much harder than a man’s. If she wants to secure a place in the middle class, she needs to get through her degree and sort out her citizenship problems before having children. Even if she waits until age 30, she doesn’t have all that much time. This entry was posted in My life on May 3, 2013 by admin.